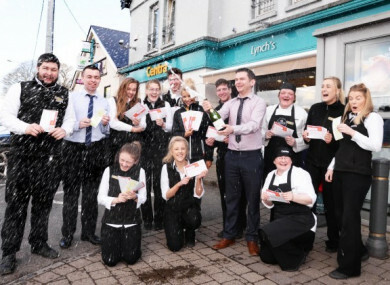 There were celebrations at the Centra in Crosshaven over the weekend after the store sold the winning ticket. THE WINNER OF Saturday’s €5,685,384 Lotto jackpot has made contact with the National Lottery. The winning Quick Pick ticket was sold at the Centra store in Crosshaven, Co Cork on the day of the draw. The owner of the store was informed of the win on Saturday, but the winner had not come forward over the weekend. Today a spokesperson for the National Lottery confirmed the ticketholder has now been in contact and arrangements are being made for the claim to be made. Tomorrow’s EuroMillions jackpot is an estimated €45 million. Email “Mystery winner of Saturday's €5.6m Lotto jackpot comes forward ”. Feedback on “Mystery winner of Saturday's €5.6m Lotto jackpot comes forward ”.